When I was younger I was absolutely obsessed by anything Jacqueline Wilson wrote. Every time she released a new book I was at the shop snatching it up because I loved her stories. 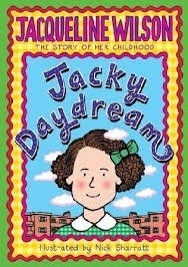 One book I especially remember loving by her is her autobiographical book Jackie Daydream. I loved reading about her childhood and post-WWII England, it was really interesting and I still have it on my bookcase today. I even named my hamster Pearl after the main character from My Sister Jodie (I still have her and every time somebody asks about her name I resist my inner twelve year old☺️). I definitely recommend reading any of her books (no matter what age) as they really impacted my childhood and I’ll never forget any of the stories.